The almond is a drupe (not a 'nut' by definition) which calls the Middle East and South Asia home. During ancient times, this beauty miracle started making its way along the Mediterranean through Africa, Europe, and eventually the United States. Now it's in many of our hair and beauty products. Sweet Almond Oil is one of the best oils for use on your hair--it helps damaged and dull hair become shinier & stronger. Almond Oil is an all natural substance high in vitamins A, B, D and E, magnesium, zinc, potassium as well as healthy fats. All hair types will benefit from this awesome oil. Sweet Almond Oil is extremely nourishing to not only the lengths of the hair but the roots as well. Almond oil is lighter than many other helpful oils, which makes it an excellent natural resource for leave-in protection. Because Almond Oil is lighter, it is also an excellent option for finer hair that gets weighed down very easily. Also because of it's weight, almond oil a perfect base for other helpful essential oils that may further moisturize the scalp, helping to fight off dandruff. Sweet almond oil contains a high concentration of proteins and vitamins A, B and E, all of which help add shine to dull, dry hair. Additionally, fatty acids omega 9, 6 and 3 help to reflect damaging UV rays and protect hair from the sun. This helps prevent the dullness that comes from hair that is very dry. It also forms a thin, oily layer on the hair which protects it from further damage and strengthens existing hair. Applying the almond oil also gives the hair a lustrous, healthy and attractive appearance and is therefore great for people with dull hair. If you want more shiny hair it is definitely worth giving almond oil a try. The massaging of sweet almond oil into the scalp may help stimulate hair growth and may help to reduce hair loss. Moisturizing the scalp with sweet almond oil provides hair with strengthening vitamins and magnesium at the root of hair, which can aid against excessive breakage as well as increase blood circulation to the scalp to promote hair growth. You can massage almond oil onto the scalp the nights before you are ready to wash your hair the following day. Sleep with a satin bonnet so your pillow does not become oily. Do this consistently every time you wash for the best results. Sweet almond oil contains vitamin A, B and E in addition to omega 9, omega 6 and omega 3 fatty acids that help keep hair strong and healthy, preventing against breakage. Sweet almond oil’s natural moisture-sealing properties help to replenish hair and also fight against split ends by holding moisture in hair for longer periods of time. Almond Oil is a great sealant on wet hair over stylers and can also be used on day 2 hair and beyond, concentrating on the ends, to help hold in moisture in and further protect the fragile length. Bonus: It's a Great Skincare Ingredient! Almond oil contains essential vitamins for skin health and beauty including vitamins A, E, and D. It also contains healthy fats which are important for keeping the skin supple and well hydrated. Because of this, many cosmetic companies use almond oil in their products as the primary ingredient. To gain even more beneficial effects with almond oil for the face you can also mix it with other substances such as honey or other vegetable oils but almond oil on its own will also work extremely well. Almond oil massage helps to reduce dark circles under eyes, remove dead skin cells, and improves the texture of your facial skin. Another benefit of taking almond oil facial massage before bed is that the solution is actually very relaxing. Almond oil is a pure and natural substance with no chemicals. 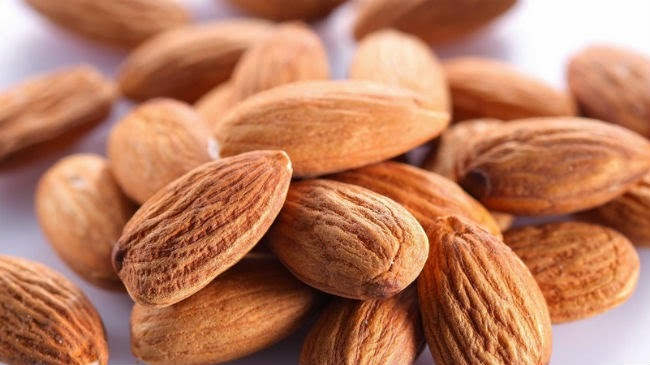 The most common benefit of almond oil for face is that it can be used as daily moisturizer. It not only softens up rough or dry skin, but almond oil also creates protective layer on the face. Apply this moisturizer daily for smoother and softer skin. The best time to use almond oil for facial massage is right before bedtime. It ensures that the oil will stay long enough so that it can perform its functions well. There are many products out there that claim to help with under eye dark circles. But if you are looking for a more natural solution, almond oil is always a good choice. You can simply apply the oil in the dark areas before bed, so you can let it work while you are asleep. For optimum results, you need to perform this treatment everyday for several weeks. This treatment will not only help the under eye dark circles fade, but it also can help to reduce dark eyelids and crow’s feet. Wet your hands with warm water, and then massage the oil to all areas of your face. You can even apply makeup after the oil is fully absorbed. You can do almond oil face massages as often as nightly. Massage a couple of drops onto face and in a circular motion. Be very gentle with your skin. Almond oil is an excellent carrier for salt and sugar, so you can use it as the carrier oil for your facial scrub. In general, the salt or sugar works by removing dirt and rough or dead skin cells from the face. Use salt if your skin is more oily prone or sugar if your skin is more dry. The almond oil works by immediately moisturize the scrubbed skin. A mix of almond oil with sugar is also effective to soften the lips. Apply this treatment once or twice a week for best results. Please remember that such solution is not recommended for people with sensitive skin or acne problems. Wash your face thoroughly by using warm water after applying this facial scrub. People with acne problems or sensitive skin are not suggested to use almond oil for facial scrub, but they can use the oil as facial cleanser. The good thing is that you don’t need to mix it with anything. Apply almond oil directly to your facial skin and leave it for several minutes. Almond oil facial cleanser removes dirt as effectively as the facial scrub. Basically, the cleanser will open pores, which will help to force dead skin cells and dirt to come out to the surface. As you wash your face, the dirt will also go away. It also makes a gentle eye makeup remover as well. Apply a generous amount of almond oil on dry skin, massage it in and then splash a little bit of water, continuing to massage. Rinse away everything with cool water and pat dry gently with a towel. This article was originally published on October 2014 and has been updated for grammar and clarity.